To create these "synthetic antibodies," the researchers used carbon nanotubes hollow, nanometer-thick cylinders made of carbon that naturally fluoresce when exposed to laser light. In the past, researchers have exploited this phenomenon to create sensors by coating the nanotubes with molecules, such as natural antibodies, that bind to a particular target. When the target is encountered, the carbon nanotube's fluorescence brightens or dims. The MIT team found that they could create novel sensors by coating the nanotubes with specifically designed amphiphilic polymers polymers that are drawn to both oil and water, like soap. This approach offers a huge array of recognition sites specific to different targets, and could be used to create sensors to monitor diseases such as cancer, inflammation, or diabetes in living systems. "This new technique gives us an unprecedented ability to recognize any target molecule by screening nanotube-polymer complexes to create synthetic analogs to antibody function," says Michael Strano, the Carbon P. Dubbs Professor of Chemical Engineering at MIT and senior author of the study, which appears in the Nov. 24 online edition of Nature Nanotechnology. The new polymer-based sensors offer a synthetic design approach to the production of molecular recognition sites enabling, among other applications, the detection of a potentially infinite library of targets. Moreover, this approach can provide a more durable alternative to coating sensors such as carbon nanotubes with actual antibodies, which can break down inside living cells and tissues. Another family of commonly used recognition molecules are DNA aptamers, which are short pieces of DNA that interact with specific targets, depending on the aptamer sequence. However, there are not aptamers specific to many of molecules that one might want to detect, Strano says. 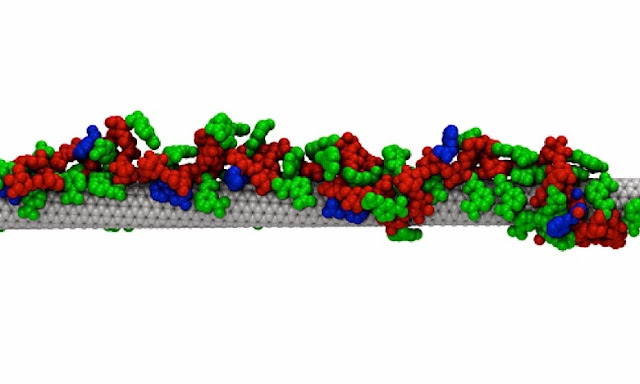 These loops form a new layer surrounding the nanotube, known as a corona. The MIT researchers found that the loops within the corona are arranged very precisely along the tube, and the spacing between the anchors determines which target molecule will be able to wedge into the loops and alter the carbon nanotube's fluorescence. "The idea is that a chemist could not look at the polymer and understand why this would recognize the target, because the polymer itself can't selectively recognize these molecules. It has to adsorb onto the nanotube and then, by having certain sections of the polymer exposed, it forms a binding site," Strano says. "This new concept, being based on the molecular recognition from the adsorbed phase itself, does not require the use of antibodies or equivalent molecules to achieve specific molecule recognitions and thus provides a promising alternative route for 'on demand' molecular sensing," says Cognet, who was not part of the research team. "What's happening to the polymer and the corona phase has been a bit of a mystery, so this is a step forward in getting more data to address the problem of how to design a target for a specific molecule," Landry says.